The leaves are changing color, and that means it’s the season for spooks, ghosts, and ghouls to emerge once more. Halloween only comes once a year, and Lexington really knows how to celebrate. The Thriller & Halloween Parade is a great family activity with dancing, a parade, and a spooky after party. On Saturday, October 26th (October 27th in case of rain) pre-show activities will start at 6:00 pm. 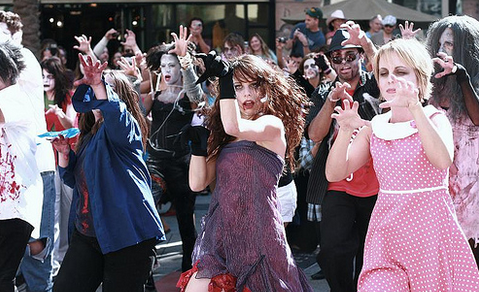 By 8:30 pm, zombies will flood Main Street and boogie their way from the Kentucky Theater to Mill Street. After the zombies have done their dance, families will be treated to a Halloween fun parade. The town will then gather for a party at Fifth Third Pavilion. Zombies of all ages and abilities are welcome to participate in festivities, as long as you attend rehearsals to learn the choreography and parade schematics. Rehearsals are held throughout October at the Mecca Live Studio. To learn more about participating, contact Mecca at info@meccadance.com or call 254-9790 and ask about the Thriller dance.